The shape of Nepal is like a rectangle – the length from east to west is greater than the width from north to south. Nepal is a multi-cultural country. Just as there is no particular ethnic group called “Indians”, similarly there is no particular ethnic group called “Nepalese”. The inhabitants of Nepal are of Austric-Mongolo-Negroid origin. There are a number of languages in Nepal including Nawari, Gorkhali, Angika, Bhojpurii, Rai, Lepcha, Sherpa, Bhutia, etc. The most important language in Nepal is Gorkhali. The inhabitants believe in different religions – some are Hindus who follow the Shaeva or Shakta cults, while others believe in a mixed religion of Hinduism and Buddhism. Large parts of southern Nepal are plains, but in the north are the Himalayas. In the west is the Terai and in the east, the Duars. Central Nepal is colloquially called “Madesha”. The inhabitants of Nepal have the same ethnic origin as those of India, and they introduce themselves as Madeshi. Generally the Nepalese people have pointed noses; only the Gorkhas have flat noses. The language of the Morang district of Nepal is Angika, while Bhojpurii is the language of the westernmost part of Nepal. Bengali is spoken in Jhanpa district in the east. The Gorkhas are devoted to Shiva. One of the names of Shiva is “Gorakśanatha”, and as the people are the devotees of Gorakśanatha, they are called “Gorkhas”. The Gurung and Rai communities have mixed ethnic origins – their forefathers were Indians and their foremothers were Mongolians. "Northeastern India has immense socio-economic potential. the collective welfare of all the inhabitants." They are Mahayanii Buddhists by faith and they eat beef. The Gorkhas eat raw buffalo meat. The Joshi Brahmins who live in the hilly regions are Pashchimá Brahmins – that is, Brahmins from western India – and they usually use the surname Upadhyaya. The Lamas who settled in Nepal are of Tibetan origin. The central part of Nepal – that is, the plains – is called the Kathmandu Valley. It is inhabited by the Newars who are tall and follow the Hindu religion. The other inhabitants of Nepal are the Sherpas, Lumbus, Lepchas, Bhutias and Tibetans. The people of Bengali origin are settled in Jhanpa district. The languages of the regions other than Jhanpa district arc of the Indo-Tibetan group. The oldest script of Nepal is Bengali. Up to 1773, the Newars were the rulers of Nepal, and the royal language was Newari written in Bengali script. In 1773 the Gorkha leader Prithvi Narayan Shah forcibly occupied Nepal on the festive day of Dolyatra. Thcre is no such language as Nepali. In fact, as many as 17 languages are spoken by the inhabitants of Nepal and Gorkhali is one of them. About 100 years later, the British general Octonloney occupied Nepal. A truce between Nepal and Great Britain was signed at Sugaoli which became known as the “Treaty of Sugaoli”. According to this treaty, the British army would include a Gorkha regiment in its ranks; the inhabitants of Nepal would be paid in Indian currency at Motihari near the Nepalese border; there would be no passport or visa system between Nepal and India; and there would be tree trade between the two countries. Bhutan is located to the north of Bengal and to the east of Nepal. Both the inhabitants and language of Bhutan are called “Bhutia.” The language is of the Indo-Tibetan group. The people follow the Buddhist religion. Bhutan was also a British colony, and British currency was once prevalent there, but now Bhutan is a sovereign state. To the north of Bengal, and to the east of Nepal and to the west of Bhutan, is Sikkim. Its inhabitants are Lepchas and Bhutias. Their religion is Mahayajani or Lama Buddhism. To the east of Nepal is NEFA – North East Frontier Agency – which is now known as Arunachala. Its old name was “Baliapaŕá” This small state of India is situated next to China. The inhabitants speak Assamese and Bengali and follow the Buddhist religion. Christian missionaries converted a small portion of the population to Christianity. After independence the area was renamed Arunachala, and it enjoys the status of a B-class state (that is, a small state) in the Indian constitution. The original inhabitants of Darjeeling were Lepchas and Bhutias. The British developed Darjeeling as a hill town. Darjeeling district is similar in size to the Garbeta block of Midnapore district in Bengal. Tea, maize, the large variety of cardamon and oranges are grown in abundance here, but there are no particular mineral resources. Agricultural produce is exported from Darjeeling. In Darjeeling district there were about 300,000 Nepalese – that is, Lepchas and Bhutias. About 200,000 of these were permitted to settle in India after being driven out of other areas. Some Nepalese settled in Darjeeling district and some cleared the jungles in Madarihat in Jalpaguri district and settled there. Amongst the Nepalese who were allowed to settle in India, some were Gorkhas. Those who settled in Darjeeling district are divided into two distinct groups – Nepalese and non-Nepalese – and amongst the Nepalese there are Gorkhas and non-Gorkhas. So in fact there are very few Gorkhas in Darjeeling district. The Cachar, Goalpara, Dhubri, Nagaon and Kamrup districts are the Bengali speaking districts of Assam. The British occupied Assam in 1824 and later separated it from Bengal Presidency in 1912. The inhabitants of Cachar district were originally Bengalees. The king of this area was Shiva Singha and the capital of his kingdom was Haflong. The British occupied Cachar after defeating him. The areas of Goalpara, Coochbihar, Sitai, Dinhata, Mathabhanga and Shitalkuchi formerly constituted Rangpur sub-division. 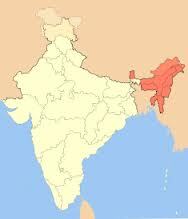 Before the British occupied this region, it was included within the Coochbihar Native State. Later Goalpara was separated and the remaining portion was known as the British Rangpur sub-division. Goalpara was made a separate district with its headquarters at Dhubri. The northern part of Dhubri is adjacent to Bhutan and the inhabitants are mainly Rajbangshi Bengalees who speak the Rangpuri dialect of Bengali. In the census reports their mother tongue is wrongly recorded as Assamese. The northern part of Nagoan district is full of forests and jungles, and the southern part is hilly and also full of forests which are inhabited by elephants. Most of the population are Bengalees who speak Bengali. Only a small number of people speak Assamese, and most of these people use surnames such as Mandal, Bhunya, etc. In Hojai, Lanka and Lumding all the people are Bengalees. The headquarters of the Kamrup district is Gwahati which is also the capital of Assam. The people are mostly Assamese. Some of the sub-divisions like Nalbari, Barpeta, Haoli, etc. are full of forests and are the Bengali speaking areas. Some parts of Barpeta district are entirely Bengali speaking, but the number of Bengali Muslims is more than the number of Bengali Hindus. Meghalay comprises the Garo Hills, United Khasia and Jayantia Hills and the Tribal Council. Kumuda Ranjan Singha was the king of the old Meghalay state. The inhabitants are Garos, Khasiyas and Bengalees. The Bengalees outnumber the rest of the population. Shillong is predominantly a Bengali city. The royal family of Manipur used to speak Bengali. The kings of the Tripura and Manipur were initiated by Chaitanya Mahaprabhu. The inhabitants of Manipur follow the Gaoriya Vaeshnava religion, and their main scripture is Chaitanya Charitamrita written in Bangali. The capital is Imphal and the language is Mithei Manipuri written in Bengali script. The army of Manipur was chiefly manned by the Kukis. Amongst the different ethnic groups of the northeastern region of India, an atmosphere of cordiality and fraternity has to be developed. Amongst the Bangali Hindus and Bangali Muslims, cordial ties must also be well-established. All kinds of social, economic, cultural and educational activities must be accelerated. This work should continue with a lot of intelligence and tact. Movements and agitations against the exploitation and deprivation of the local people must be launched immediately, and the Bengali speaking areas must be brought within the purview of the Bangalistan movement. The future of the entire northeastern region of India is very bright. In North Bengal, the Assam Valley, Karimganj, Silchar and Cachar the topography, soil and climate are quite different from those of Ráŕh. Ráŕh is about 300 million years old and at that time these places were under water. When the Himalayas came into existence, they were under water. After the formation of the Himalayas, they rose up out of the sea and were built up with the accumulated sand and silt from the Himalayas. All these places did not come into existence at the same time, which is why we can see three areas with distinct types of soil in North Bengal. One is diyára, river side alluvial soil; the second is t́ál, large strips of plain alluvial soil; and the third is barren or sandy soil. The hills of Ráŕh are higher than those of the Khasia and Jayantia Hills. As a result of constant erosion for 300 million years, the mountains of Ráŕh have become small hills. In ancient times the rivers of Ráŕh were ice fed, but now they are rain fed. Like Ráŕh, the rivers of Tripura are rain fed, but the duration of the rains in Tripura is longer than in Rárh. As a result, for most of the year the rivers remain full of water. Hydroelectric plants for industrial development can be easily established in Tripura. If the government wants to generate cheap electricity in Tripura, North Bengal and the Assam Valley, hydroelectricity is the most suitable source of power. In comparison, the cost of solar energy will be greater. In this vast area there are many large rivers like the Mahananda, Balasai, Tista, Buritista, Jaldhaka, Godadhi, Brahmaputra, Barak, Kushiyara, Gomati and Pheni. From these rivers it is quite easy to produce much hydro-electricity. The soil in this region is slightly sandy, but the soil in Ráŕh is sticky. Sticky sandy soil is ideal for jute, pulses and other summer crops. Good summer crops include Bengal gram, horse gram, pea, etc. The rivers of North Bengal carry a large amount of alluvial soil, and the soil of this region is very soft. So while constructing dams, a strong concrete foundation must be built. The Koshi river has changed its course about 100 times in the last 135 years because of the soft soil in the area. It is essential that the foundations and sides of all the dams constructed in this region are made with concrete so that the dams will last a long time. This is also a jute producing area. From jute, industries such as nylon, rayon, match sticks, plastic and jute’s wool can be developed. High quality warm clothing can also be produced by manufacturing nylon and wool. In all these areas jute spinning mills can be developed. To establish cotton spinning mills in Ráŕh, vapourisation will have to be artificially produced in factories, but in North Bengal the local climate is very congenial to fibre production, so artificial vapourisation is not necessary for spinning jute. In North Bengal custard seeds, drumsticks and mulberry plants are plentiful, hence there can also be abundant silk production. This area – except Balurghat, Raiganj and the northern portion of Malda – is full of alkaline soil which is ideal for mangoes and lichiis. Pineapples and bananas can also be grown in abundance. Jalpaguri, Coochbihar, Dhubri, Karimganj, Cachar, the Assam Valley, Silchar and Tripura are ideal for the cultivation of jackfruit. From banana, pineapple and jackfruit good quality fibre can be manufactured for the cloth industry. For the cultivation of pineapple and bananas, a humid climate is required, but jackfruit requires no particular climate – it can grow in all climates and soils. The climate of Tripura is extremely congenial for jackfruit. Besides fine fibre, alcohol can also be prepared from jackfruit in Tripura and alcohol related industries, pharmaceuticals and medicines can be developed. High quality sugar can also be prepared from jackfruit. In the Terai area where there is heavy rainfall, oranges can grow in abundance, therefore medicinal industries from fermented orange juice can also be set up. In Jalpaguri bran oil can be produced from paddy husks, and if it is mixed with limestone, large scale cement industries can also be established. In Darjeeling and the Assam Valley there are rich deposits of copper. In Cachar, Karimganj and Tripura soft wild bamboo is plentiful which can be used as a raw material for the paper, plastic and rayon industres. A new type of alternative food can be extracted from the green leaves of the bamboo plant. Fine fibre can be produced from pineapple leaves. If dams are constructed on the rivers, artificial canals can be built and used as water transportation routes for power boats. On both sides of the roads segum, mahoganv and shal trees can be planted. The local climate is very congenial for the rapid growth of these types of trees which can be utilized for the production of non-mulberry silk. To establish industries in this region, hydro-electricity can be easily produced. Electricity can also be produced from solar energy, but it will be more expensive. In Raiganj, Balurghat and North Malda, aus paddy will grow abundantly. North Cachar, Mikar Hills and Lumding have the same sort of problems as Tripura. The Meghalay rivers are partly ice fed and partly rain fed. This area receives heavy rainfall, so it is advantageous to produce hydro-electricity. The soil is not very fertile, so food crops do not grow well. Sugar cane can be grown profitably, so the paper and sugar industries can also be developed. The Meghalay Hills are similar to those of Tripura, and the plains are like North Bengal. In the regions where there is heavy rainfall, mango and lichii can grow, but in certain places they will be infested with worms. The best mangoes and lichiis in India are grown in this region. The more one proceeds towards the coast, the more humid the climate becomes, and such a climate is ideal for growing pineapple, banana and betel nut. In English supari means “areca nut” but in Indian English it is “betel nut”. Betel is a Tamil word which means music. The more one proceeds towards the west, the drier the climate becomes. Such a climate is not ideal for banana, pineapple, etc. In Mithila in Bihar, no pineapple or banana is grown. Northeastern India has immense socio-economic potential. This potential should be properly harnessed for the collective welfare of all the inhabitants.